So when I spied big piles of vibrant green asparagus at the farmers’ market I bought 7! (yes, seven) bunches just to stock up on asparagus and even freeze some for later. (Few weeks later I can tell you that sadly (or maybe not so sadly) not one of those 7 bunches ended up in my freezer 😉 ). I have read of this appetizer a few years ago for the first time and I knew it must taste amazing. What’s not to like: crispy salty bacon with fresh asparagus in the same bite, yum! 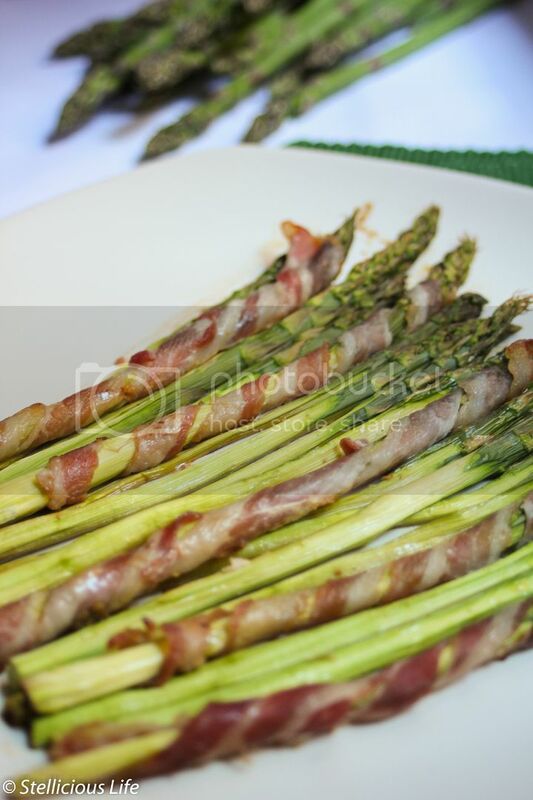 Besides the flavourful taste, what I love about this recipe is how utterly simple it is: you wrap your asparagus in bacon, put them in the oven and half an hour later ta-da, crispy bacon-wrapped asparagus ready to be snacked upon! 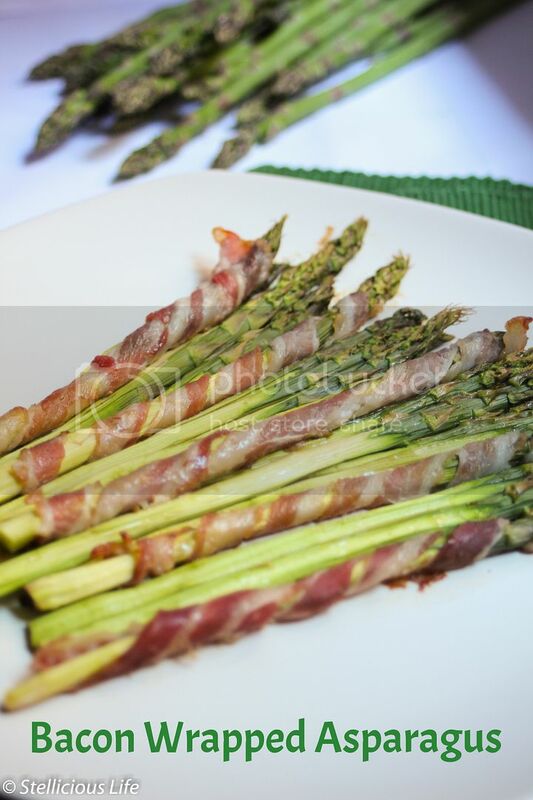 Deliciously crunchy bacon wrapped around some fresh green asparagus, it truly is the best of both worlds! Cut the bacon strips in half so you have just as many thin bacon strips as many asparagus stalks you have. Wrap one bacon strip around each asparagus stalk. Place the bacon-wrapped asparagus stalks on parchment paper-lined baking sheet and bake for 20-30 minutes on 400 F (200 Celsius), or until the bacon is crisp. Enjoy as an appetizer or as a side-dish, it is best while still warm. It can be served as an appetizer, extraordinary side-dish, or cut into pieces it can even complement and jazz up some risotto or green salad. Recipe from Stellicious Life. All images and content are copyright protected. Please do not use my images without prior permission. If you want to republish this recipe, please re-write the recipe in your own words and link back to this post for the recipe. Thank you. Do you like asparagus? Any good asparagus recipe you can recommend? I’m always looking for some new ones to try.